Today is my Hebrew birthday. I want to take a moment to bless you with revealed good and growth in your physical needs and spiritual journey. In this weeks Torah portion we are told individually of the birth of the tribes. Each and every one of their pregnancy's and births are told to us; "and she become pregnant and she gave birth etc.". Each and every one of us even prior to conception is part of the Divine plan. Our birth is G-ds way of saying you matter. All the details of our lives, the gifts, the blessings and the challenges all come together to set the stage for us to fulfill our lives purpose. Is that not reason enough to feel lucky today? This is true for all of creation, every creature but even more so for humankind. This is even more so when we talk of the Jewish people. Our People were chosen for our unique mission to bring G-dliness into the world. And so, when we embrace our mission and purpose and live it each day we will be able to say, "I feel lucky today". Earlier in the week after returning home from the annual Chabad conference of Shluchim reviewing in my mind the interactions, sessions and inspiration. I was attempting to translate all that I experienced and learned into practical take away application. Perhaps it was because of the late nights hanging out and reconnecting with friends, or perhaps the abundance of information and overwhelming experiences, whatever the case I couldn't compartmentalize it all. Until it struck me, that in a word what I was feeling and internalizing was the good fortune and good luck that I had to be a Shliach (emissary) of the Rebbe and the good fortune of being able to live a life of service. It's not even so much about the life of "service" as much as the knowledge that I am in the right place in life striving each day to fulfill my purpose on this earth. I write this as I head to NY for the Kinus Hashluchim - the annual conference for Chabad Rabbis around the world. Getting together with other Rabbis, we learn from each other’s successes and failures. At the same time, we get the opportunity to reflect on our own successes and failures. Thank G-d there are many blessings in the life and the work of a Chabad Rabbi. A Rabbi's desire is that the blessings should be noticeable. What about when there is failure? Is there blessing in the failures? At the Kinus, one of the things we learn is that "failure is not the opposite of success, it is part of it", attributed to Arianna Huffington of the huffington post. We see this in the blessings of Yitzchak (Issac) to Yaakov (Jacob). The language used is Vayiten - and G-d will give. The commentaries learn that the seemingly extra word "and" implies that He will give more than once. When we do good deeds, we are creating light and goodness in the world. When we make a mistake and do something wrong, G-d gives us the opportunity to receive again (and more than the conventional way), it is an opportunity to change darkness to light, causing a greater illumination. For example, conventionally - a Jew cannot elevate non-kosher food to a holy status. However, when a Jew chooses to take on Kosher as a commitment of love, known as “teshuvah mahavah", the non-kosher food of the past is then elevated to a holy status. This is through an experience known as "zedonot naaseh kezachiyot" - advertent errors become merits. Or, in the words of Arianna Huffington: Failure is not the opposite of success it is part of it. 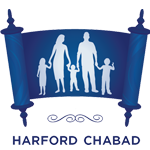 Check it out the Harford Chabad website. Yup, that’s correct our website in now responsive. 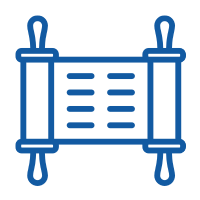 In short it means that when you see it on your cell phone or tablet or computer, the display will respond according to your device. It will enhance your web viewing experience to make reading easier and minimize resizing, panning, and scrolling for simpler navigation. This concept was introduced into the world almost 4000 years ago by Abraham. In this week’s Torah portion, when Abraham is giving instruction to his servant Eliezer to go find a wife for his son Isaac, he says: "the G-d of Heaven, who took me from my fathers house...". When G-d first took Abraham from his father’s house, indeed G-d was only the G-d of Heaven - not responsive. But Abraham, through his faith and self sacrifice, turned G-d into the G-d of Earth as well, a.k.a. responsive. What does this mean on a practical level? It means that G-d is your friend. G-d is close to all of us. G-d responds to us. G-d is not a distant G-d but our G-d, to whom you can turn to in good times and in rough times. G-d wants us to be connected to Him in all we do. Not only when we are doing Holy things but also when we are engaged in mundane behavior. In all these instances, G-d wants us to be thinking about Him and enriching the world around us with His presence. Like any relationship it requires an investment of self. There is a story told about a girl named Plitith who lived in a hostile and unfriendly town. The laws of this town included things like: one may not have any consideration for the poor, one may not offer hospitality to the passing stranger, selling food or water to a foreigner is forbidden. Plitith was caught secretly given food to a stranger who was near starvation and was subsequently burned in public. Another young girl, caught feeding a starving beggar, was smeared with honey and placed upon the city wall. She died from the stings of the bees attracted to the honey. The name of this town was Sodom. Pltith was Lot's daughter and Abraham's great niece. Many people know the story of Sodom and Gomorrah; a region of depravity and moral decay. The only thing to salvage it was to overturn and destroy the entire region. Abraham pleaded with G-d to save it but could not find 10 righteous people in the region for whom to find merit for. While the story is referred to as the destruction of Sodom and Gomorrah, in truth it included the cities of Admah, Zeboim and Bela (Bela/Zoar was saved due to Lot's request). We see that these cities were allied politically in last week’s Torah portion where it named their kings, "Bera the king of Sodom and with Birsha the king of Gomorrah, Shineab the king of Admah, and Shemeber the king of Zeboiim, and the king of Bela, which is Zoar". However, the story is known as the destruction of "Sodom and Gomorrah" and not the destruction of the four/five cities. Sodom and Gomorrah also received a bonus of brimstone and fire before being overturned (genesis 19 24-25). We may want to simply explain this as a technicality. Perhaps they were the larger cities or maybe they were the capital cities of the region. There is a more practical explanation that can bring a meaningful and relevant message to us in the modern day. The cities of Shineab and Admah were not religious but they were kind and friendly. They hated G-d but loved their neighbors. On the other hand, the cities of Sodom and Gomorrah were evil to their fellow humans. We see this by the names of their kings; Bera - he was twice evil, (Bet Raah) to Heaven and to people. Birsha - he was elevated in wickedness (Rasha). Shineab - he hated (Soneh) his Father (Av) in Heaven. Shemeber - He made (Sum) wings (Ever) to fly and to spring and to rebel against the Holy One, blessed be He. While lack of following G-d can bring us to lack of success or even to death, it will not obliterate everything. However, when the fabric of our society is destroyed, when we no longer take care of our neighbor, then total annihilation and destruction occur. While rebelling against G-d is a sin, it pales in comparison to Sodom and Gomorrah. Sodom and Gomorrah is the story that must never be repeated. Lack of respect for your fellow man is not just wrong it is unacceptable and must be eradicated.